The decision by South Africa President Jacob Zuma to sack the finance minister has been widely criticised. South Africa's currency fell close to a record low against the dollar on Thursday morning as the markets were digesting the news. 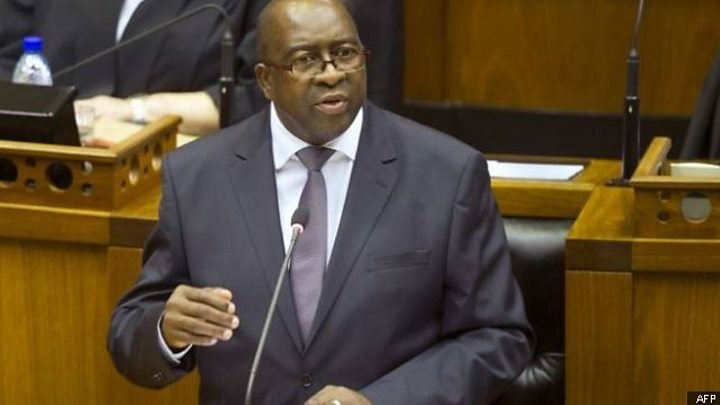 BBC Africa business reporter Lerato Mbele says that Nhalnhla Nene's attempt to rein in spending may have unsettled some people loyal to the president. The sacking comes as South Africa's economy is struggling to grow. President Zuma said Mr Nene was being moved to "another strategic position", but did not elaborate on the reasons behind the decision. He has replaced him with the relatively unknown David van Rooyen. The rand fell to below 15 to the dollar on Thursday morning and stock prices also fell in Johannesburg as trading began, Reuters reports. "The removal of a technocratically sound, decent, hard-working, well respected, fiscally conservative and reform-minded finance minister is a serious blow," Peter Montalto, an analyst at Nomura, told the AFP news agency. South Africa's main opposition leader Mmusi Maimane criticised the sacking on Twitter saying that Mr Zuma "has again proven himself to be a President incapable of making the right decisions". Another opposition party, the Economic Freedom Fighters, said the president appointed Mr Van Rooyen because he knows he "will not stand up to him when he wants to do wrong things". Shock, surprise and sarcasm dominate the reaction to the sacking of Mr Nene. A cartoon called "Zuma's wrecking ball" of the president's head, cast in stone, butting everything in sight is being widely shared on social media. The general feeling is that President Zuma has dismissed a minister who stood for integrity and prudence in managing the country's finances. Although Mr Nene was finance minister for just over 18 months, he has already been able to stand his ground on issues of wasteful government expenditure. He has openly criticised wage increases for public servants; questioned the management of public utilities; opposed a bailout for the national airline and did not approve a proposal to buy the president a new private jet. In the main, investors regarded him as a safe pair of hands steering South Africa's economy in uncharted waters, especially in the midst of the recent global volatility and the steep decline in commodity prices. South Africa's finance ministry has come under "the most intense political pressure in recent months", reports the economic news website Fin24. It suggests that Mr Nene's removal was down to his lack of "politcal clout". He was seen as one of the few people in government to oppose certain spending plans, including a programme to build new nuclear plants, reports Business Day newspaper. Last week, two credit ratings agencies downgraded their assessments of South Africa. Fitch reduced its rating to just above junk status and Standard and Poor's moved its outlook from stable to negative. Unemployment in South Africa is above 25% and the economy is growing very slowly.